Entertainment Tonight has been allowed to sneak onto the set of Prince of Persia The Sands of Time, the upcoming movie based on the video game of the same name. 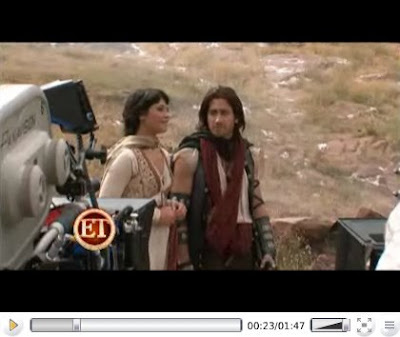 In this Prince of Persia clip there is even a short interview of Jake Gyllenhaal, who plays the lead role of Dastan. I am glad that Jake Gyllenhaal has been selected in the role of Prince Dastan: he looks especially fit for the role! I bet that the movie Prince of Persia that it will spawn into a sequel and even a movie franchise! hello . thanks for prince of Persia trailer . I'm an Iranian and I'm really happy for the Iranian prince movie . but I want to say just one thing : in the some countries peoples knows Iranians as Arabians but this is not true . Iranians are not Arabians . in 300 movie says big lies about Persian empire and people . do you know the great Cyrus is the first king in all over the world that says about human rights ? search about The cylinder Cyrus’s human rights . my English language is not good . sorry :X . thanks again .